Who Is Your Patron Saint And Why? Share Your Story Squirrels! Few practices of the Catholic Church are so misunderstood today as devotion to patron saints. From the earliest days of the Church, groups of the faithful (families, parishes, regions, countries) have chosen a particularly holy person who has passed on to intercede for them with God. Seeking the intercession of a patron saint does not mean that one cannot approach God directly in prayer; rather, it’s like asking a friend to pray for you to God, while you also pray—except, in this case, the friend is already in Heaven, and can pray to God for us without ceasing. It’s the communion of saints, in actual practice. via Patron Saints – The History of Patron Saints – How Patron Saints Are Chosen. I’ll go first! My patron saint is St. Padre Pio. Before I was Catholic, I had a dream where I was being chased by something evil. I was scared and called out “Padre Pio pray for me”! I woke up and thought to myself… who is Padre Pio? To be fair, I’m sure I had read about Padre Pio at some point and subconsciously knew who he was, but seriously, at that time I didn’t even know I could ask a saint for help! 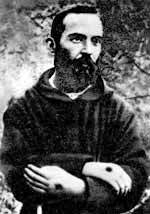 So because I am a squirrel and I like to forage I immediately went out and read about Padre Pio. A few weeks later I was at a friend’s house who owns an Antique store and loves Catholic antiques. She pulled a box out of her garage stocked full of prayer cards, metals, prayer books, rosaries … you name it… and told me to take whatever I’d like. I reached in and pulled out a prayer card, prayer-book and metal and they were all about Padre Pio even though the box was full of a myriad of different saint memorabilia. When I brought the items home I showed them to my two-year old who picked up the prayer card and said “Papa!” like she knew him. Do you watch for repeating patterns in your life? I do and this was one of them I’m pretty sure I was meant to notice! I feel like St. Padre Pio told me clearly ” Hey chica! Check it out—I am your Patron Saint!”. Even if it was all a coincidence, it has been wonderful to get to know him. Reading about St. Padre Pio has taught me many lessons. Escape With Me To The Carmel Mission in Sunny California! Mine is St. Paul. And it’s a long story, one I hope to be able to tell soon — I’m nearly at that point in my story, but it’s a very personal story so I’m still working through it. But I definitely feel that throughout my journey, throughout my whole life as a Protestant and up until now, he’s been looking out for me. Evangelicals hold Paul is such high regard — he is the center of their theology — but I always looked to him not so much for that, but for words of comfort and guidance. And when I finally stood there at his tomb, I think he played a major role in God’s nudging me to start this journey. Hmmm I’m intrigued! Looking forward to reading your story! Interesting story. My wife and I were married on the feast of Padre Pio. My personal saint is St. Francis. He interested me when I was a Protestant lad and when I went to college in Fayette, IA they were building a parish of the same name and the artist used me to fashion a life size statue for the Church. Many years later when I became Catholic I found that St. Francis’s Feast day was the same as my Birthday. I always felt since then that he had been praying for me from the beginning. Wow what are the chances his feast would be on your birthday? That’s amazing! BTW your birthday is only a few days away from mine ! I have come to know so many saints on my journey and have several favorites. Padre Pio is right up at the top of the list along with Teresa of Avila, Therese of Liseux and Saint Joseph. My patron is Saint Michael the Archangel. I carried a medal of him every night, as well as a rosary, during my previous occupation where I felt the need of protection. I’m a warrior at heart and during my confirmation when I was told that I had become a soldier of God something inside me sparked. I chose Saint Christopher at Confirmation who I knew the most about at the time. Having saints to pray to for help and to intercede for us is one of the great things about being Catholic. Growing up in a non-denominational church I had no idea that the Archangel Michael was also a saint. When I found this out I spent some time learning more about him. In this way, I have also become close to St. Michael. We all need a warrior for God, thanks for being one too! I’ve adopted (so to say) so many patron saints. I really hope that’s an okay thing to do. However, my namesake is James, and I chose the James the Greater — no offense to the Lesser — because he’s the proto-martyr and he’s been to Spain! I haven’t been to Spain yet, but when I do it will be primarily for one purpose, namely, to do the Camino de Santiago de Compostella. You can read most of St James’s story in the Gospels and Acts of the Apostles. Other than what it says in those accounts, little is known for sure, besides the fact that he’s been to Spain. I don’t know if I can follow in his footsteps as a martyr, but I can probably pull of a pilgrimage and walk the Camino. Say a prayer and maybe I will some time in the next year or 2. If I make it, when I’m there, I’ll say a prayer for you. I will say many prayers for you to make it to Spain! Here is one: God bless Biltrix (James). May your grace be bestowed upon him so his way may be clear to follow in St. James footsteps and walk the Camino in Spain. Amen. Like you, FS, I am also on the Tiber Swim Team, Class of 2012! On Confirmation I chose St. Louise de Merillac. I wanted to honor the fact that I’m in the middle of a 5-generation (and counting) succession of women named Louise. As I learned more about her, I identified with her more. She is the patroness of Social Workers, which is my current line of work. She is also one of the patrons of the local hospital where I recovered from a life-threatening illness earlier this year. The deciding fact was learning that not one but TWO major saints were influential in her spiritual development in her lifetime: St. Francis de Sales and St. Vincent de Paul. Since coming into full communion with the Catholic Church, I was given (and accepted) an invitation to participate in our parish’s board of the St. Vincent de Paul Society. It is a joy and blessing to give back to the parish that has done so much for me! Congratulations on your confirmation and your invitation to be on the board!You sound like you have been through quite a lot this year. I am sure St. Louise is praying for you. God Bless! My Saint at Confirmation is St. Elizabeth. I chose her as a patron long before Confirmation because I really liked her love of Mary and Our Lord, and because she was such a good friend to Mary. I decided to ask St. Michael to be my patron saint as well, because of my journey as a Catholic Christian and more recently, having to defend the Faith coherently against misinformation–most especially for the sake of the lapsed Catholics in my family. Super post!!! My patron saint is Pope St. Leo the Great. I read about him when I was a teenager, and though I was a fairly devout Baptist at the time, I found myself drawn to St. Leo’s story and example. I used him as a model for myself even as a Baptist, though only as an example of Godly courage and not as a St. to go to for help. When I converted to Catholicism, there was no doubt who I would choose as my personal patron saint. Today, when I face struggles or challenges or have moments that require courage in my faith, I think of Pope St. Leo the Great and how he rode out of Rome straight to the camp of Attila the Hun and by his courageous faith, turned the Huns away from Rome. I also appreciate that St. Leo boldly confronted the heresies of his time and refused to allow them to infiltrate and corrupt the Holy Mother Church. Thank you so much for sharing your saint! You have motivated me to learn more about him. In our family, we are forever losing stuff, so the saint most called upon by our family is St. Anthony. St. Thomas More is a close second as we struggle through our academic endeavors.